When it is known or virtually certain that a ball is in a red penalty area and the player wishes to take relief, the player has three options, each for one penalty stroke: (1) The player may take stroke-and-distance relief (see point (1) in Diagram #1 17.1d). (2) The player may take back-on-the-line relief (see point (2) in Diagram #1 17.1d). (3) The player may take lateral relief (red penalty area only). The reference point for taking lateral relief is point X, which is the estimated point where the original ball last crossed the edge of the red penalty area. The relief area is two club-lengths from the reference point, is not nearer to the hole than the reference point and may be in any area of the course, except the same penalty area. When it is known or virtually certain that a ball is in a yellow penalty area and the player wishes to take relief, the player has two options, each for one penalty stroke: (1) The player may take stroke-and-distance relief by playing the original ball or another ball from a relief area based on where the previous stroke was made (see Rule 14.6 and Diagram 14.6). 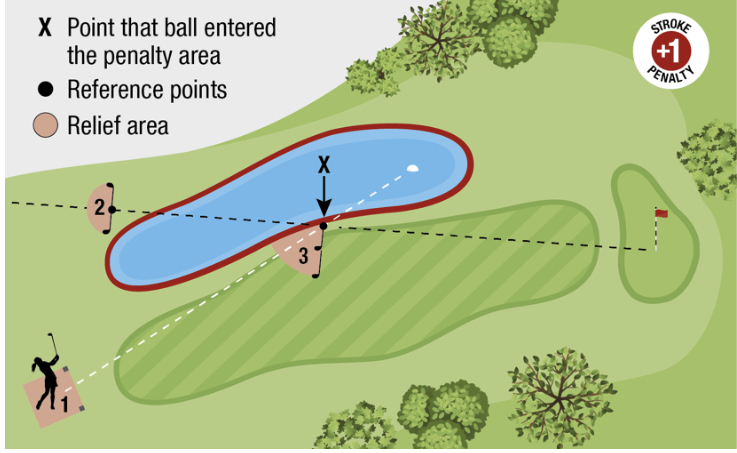 (2) The player may take back-on-the-line relief by dropping the original ball or another ball in a relief area based on a reference line going straight back from the hole through point X. 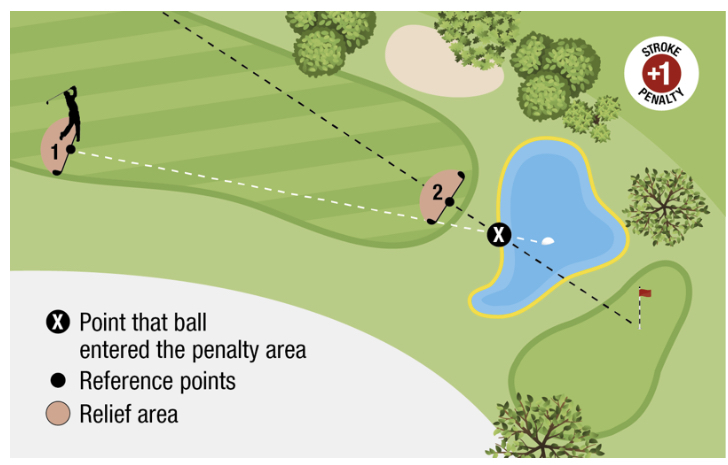 The reference point is a point on the course chosen by the player that is on the reference line through point X (the point where the ball last crossed the edge of the yellow penalty area). There is no limit on how far back on the line the reference point may be. The relief area is one club-length from the reference point, is not nearer to the hole than the reference point and may be in any area of the course, except the same penalty area. In choosing this reference point, the player should indicate the point by using an object (such as a tee).